From the end of May, ambulances and paramedics will no longer work out of Ludlow. We don’t have a formal ambulance station here but staff are based at Ludlow Community Hospital between call-outs. Even then, only 28% of top priority calls get a 999 team arriving within eight minutes in the SY7 area. The response time is 18 minutes on average. Sometimes it takes an hour. Quick response times are crucial in saving lives and preserving the quality of life. Several minutes will be added to response times when the 999 crews move to Craven Arms. For several years, ambulances and paramedics have been based at Ludlow Community Hospital. This is not a designated ambulance station. The use of the community hospital as a base for paramedics has ensured that ambulances can be dispatched quickly to Ludlow and surrounding villages. Other crews have been based at the small ambulance station at Craven Arms, eight miles from central Ludlow. When paramedics and ambulance crews are not available in South Shropshire, they must drive from Hereford or Shrewsbury. That is set to change. From the end of May, the nearest crews will be based at Craven Arms. Ludlow Community Hospital will not longer be used. That will add at least eight minutes to the fastest response times for 999 medical services to get to Ludlow. The quickest response time will be longer when Onibury Crossing is closed, which at times can be up to five minutes. “This is huge concern. It is critical that ambulances arrive quickly. For many conditions the speed of response is vital, including heart attacks and strokes. I work in a Ludlow GP practice. We have sometimes had to wait nearly an hour for an emergency ambulance. “Every minute that the arrival of an ambulance is delayed adds to the risk that a patient will suffer permanent harm, even death. “People suffering from a suspected stroke already wait seven and a half minutes longer to get an ambulance in Ludlow than stoke victims the West Midlands as a whole. This will get worse if the nearest vehicles are based in Craven Arms. “The journey to A&E can be a long one from Ludlow. Hereford County Hospital is the nearest but that is 24 miles away. It’s 30 miles to both the Royal Shrewsbury Hospital and Princes Royal Hospital. That makes the time it takes an ambulance to get to a patient in Ludlow even more important. “Ambulances often have to come long distances to Ludlow, sometimes dispatched from Shrewsbury or Hereford. But many of our most urgent calls have met a quick response from crews working out of Ludlow Community Hospital. “I am concerned that this is yet another blow for health services in Ludlow and for our community hospital. More than that, I am very worried that vital minutes will be added to response times. Patient’s health will suffer as a result. I have been busy crunching the data. 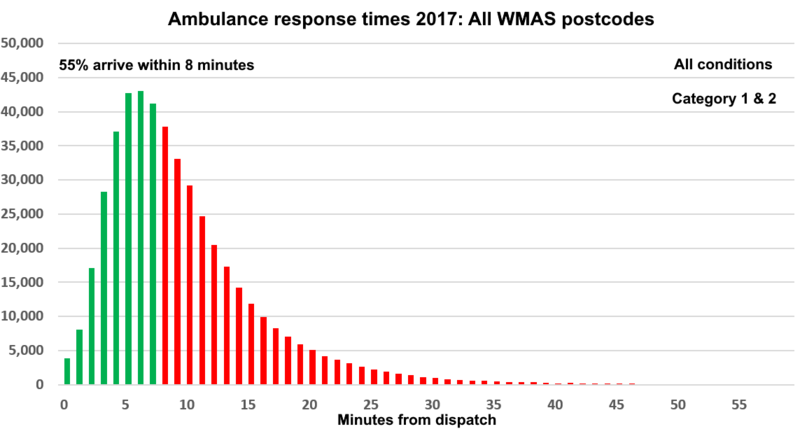 The long response times in rural areas is buried in the overall WMAS performance data, which is dominated by response times in the West Midlands conurbation. 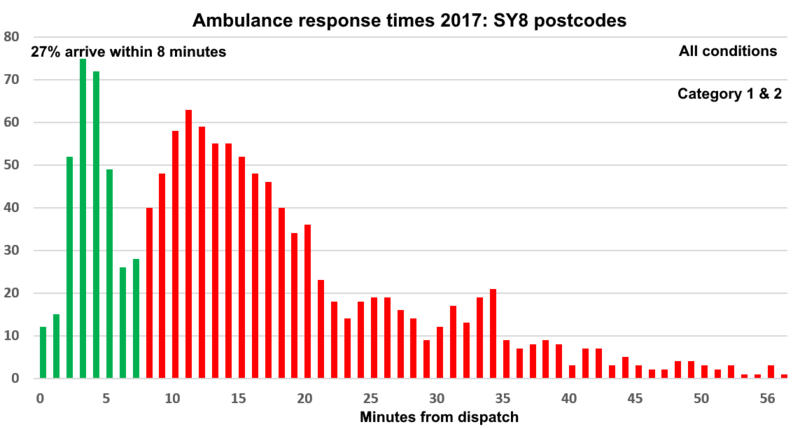 The first graph below shows the overall WMAS response time performance. The second shows the response times for Ludlow (SY7). They are significantly longer. In Ludlow, only a quarter of ambulances or paramedics arrive within eight minutes (28%). Four fifths take more than 15 minutes to get to the patient (41%). Across the huge West Midlands Ambulance Trust area, 60% of ambulances arrived within eight minutes. In Ludlow, we don’t get half that response time. WMAS told BBC Radio Shropshire this morning that it wanted to concentrate on people not buildings. The ambulance crews think it is better for them to be based at Craven Arms. That’s fair enough. But people must also include patients as well as staff. Ludlow already suffers from bad response times. This plan will make them worse. That’s a threat to life and the quality of life. Emergency here means incidents classified as Category 1 or Category 2 (these were previously Red 1 & 2). These include the most urgent responses to conditions that require immediate treatment or assessment, such as heart attacks, strokes and breathing problems, or involving children. NHS England has abandoned the target of 75% of Red responses arriving within eight minutes. It has been replaced by a 7 minute average time for fewer patients, those where death is imminent, with a maximum of 40 minute for 90% of patients. For those with “less critical” emergencies, such as those with a suspected heart attack or stroke, the response will be within a maximum 40 minutes for 90% of patients, but typically within 18 minutes. The Guardian gives a good summary of the new targets. In 2017, WMAS responded to more than 475,266 incidents across its area. The patient was taken to hospital in more than half of incidents (306,000; 64%). WMAS covers Shropshire, Herefordshire, Worcestershire, Staffordshire, Warwickshire, Coventry, Birmingham and Black Country conurbation. Ludlow here is defined as the SY8 postcode area. This includes several villages close to Ludlow. In the SY8 area, WMAS responded to 1,290 incidents in 2017. The patient was taken to hospital in more than half of the incidents (797; 62%). WMAS doesn’t supply data on where ambulance crews are dispatched from as many calls are answered by crews who are not at their normal base. Our best estimate, based on journey times, is that 29% of calls are answered by ambulances and paramedics that are within or close to Ludlow. And then there is the bright decision of OUR ELECTED Con Police & Crime Commissioner, to centralise the Police and Fire 999 “service” for the whole of the West Mercia Police patch in Worcester, rather ignoring the fact that it covers 3 VERY rural counties and the resulting problems of large Post Code areas, and village names which can be miles from the incident. Oh I see, we have a town of 11,000 near enough – hey I have a great idea…let’s move an essential service to a very small town 10 miles away…. I hope that you don’t have a heart attack Mr Hedge Hog! The average response time for symptoms of cardiac arrest in SY7 in 2017 was 21 mins 45secs. Phillip Dunne told BBC Radio Shropshire today that he supports the move to Craven Arms. He is obviously content with longer response times. Your point about population is a good one. In 2011, there were 17,193 people within 8km of Ludlow Community Hospital. There were 6,771 people within 8km of Craven Arms ambulance station.